Easter Raffle – Win The LG OLED65W7! 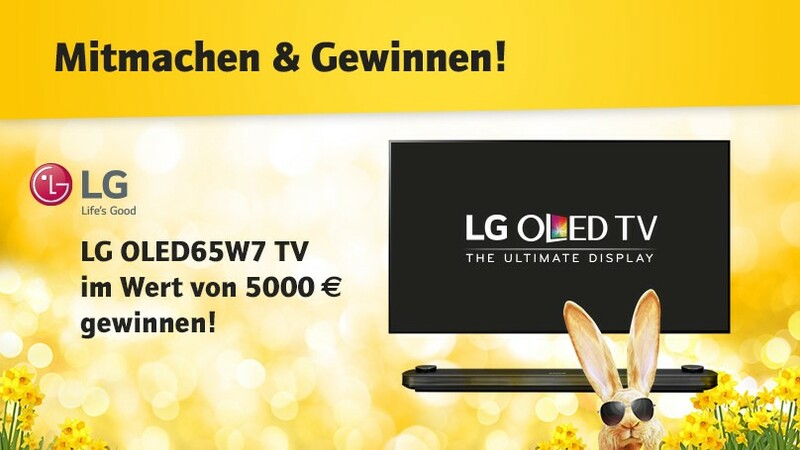 In cooperation with LG we are organizing an Easter raffle. The LG OLED65W7 worth €5,000 is up for grabs. The TV can be hung up on the wall like a poster thanks to its flat design. Come to our TV studios in Berlin from March 22 to April 7, 2018, for an LG consultation and fill out our participant card. Then you are in the running! The winner will be drawn the following week. Good luck! Participation in the competition requires fulfilling all of the following conditions. By participating in the competition, the participant accepts these terms and conditions. HiFi im Hinterhof reserves the right to exclude participants from the raffle in case of breach of these terms and conditions. Participants who use unauthorized aids or otherwise seek to gain an advantage through manipulation are excluded from participation. If necessary, the prize is subsequently revoked and reclaimed. Also excluded is who makes untrue statements about his person. Eligible for participation must be 18 years and over. Employees of HiFi im Hinterhof and LG and their relatives are excluded from participating in the raffle. Come to our TV studios in the Großbeerenstraße 65-66, 10963 Berlin and get advice on LG. Completion of the participation form. The entry form is only valid if it is completely filled in and, in particular, the name, first name and e-mail address are given. Each person can only participate once (per prize draw) and only win one prize. The competition will begin on 22nd March 2018 at 10:00. Attendance is possible until 3 pm on April 7, 2018. The winner will be determined on Monday, April 9, 2018. The draw will be attended by those participants who were in the TV studio during the competition and completed the entry form correctly and completely. The determination of the winner takes place by coincidence. The winner will receive the pictured article. The winner will receive a notification email to the provided email address. If a winner does not respond within two weeks after the notification is sent, the claim to the prize will be forfeited and a new winner will be drawn. If this is not achievable within two weeks, the prize will be forfeited. The participant is responsible for the correctness of the specified email address. The announcement of the winner is without guarantee. The prize cannot be exchanged, it is not transferable to third parties. A cash payment of the prize is excluded. There is no warranty or guarantee of the prize. In the event that the prize of a warranty claim within the warranty period provided by the manufacturer, the winner must contact the manufacturer. It can not be guaranteed that the warranty claims against the manufacturer will be given. It is up to the manufacturer alone to acknowledge the warranty claim and also whether it is complied with. The prize will be delivered without an invoice and no invoice will be made on request. HiFi im Hinterhof reserves the right to terminate the competition at any time without notice if due to technical or legal reasons, a proper implementation cannot be guaranteed. HiFi im Hinterhof reserves the right to cancel the prize for certain reasons (for example, delivery difficulties, lack of availability) and to replace it with a prize of equal or greater value. Should individual provisions of these conditions of participation be or become ineffective, this shall not affect the legal validity of the remaining provisions. It will be replaced by an appropriate provision that most closely approximates the purpose of the invalid provision. For the participation in the raffle an indication of personal data is necessary. The participant expressly agrees that the data transmitted by him for the implementation and processing of the competition will be collected and processed. The participant also agrees to receive messages related to the HiFi im Hinterhof raffle on the email address provided by the customer. In the case of a cancellation, the participant is excluded from the raffle. The personal data entered and transmitted by the participant in the course of the raffle will be collected, stored and used by HiFi im Hinterhof exclusively for the purpose of executing and processing the raffle and, for example, for the delivery of the prize – to third parties (eg post office, parcel service etc.) The data will be deleted immediately and irretrievably after completion of the competition.